Bird, birds, and more birds! In the Emerald State, you’ll see a myriad of avian species, and the Audubon Washington’s Great Washington State Birding Trail will help you identify the best places for the best bird watching. 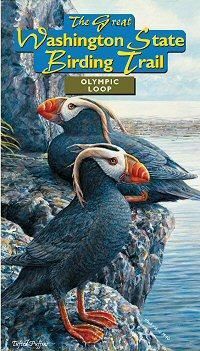 Seven routes have been identified along which you might see Bald Eagles and Pileated Woodpeckers on the Puget Loop or Sandhill Cranes and Black-Crowned Night-Herons on the Coulee Corridor or even Tufted Puffins on the Olympic Loop. Signs on the trails describe the habitat, what birds are there in what season, where to look, and how to get from a main road to the location. An app is available as well or you can order maps online through the Audubon Marketplace. Enjoy the outdoors and explore one (or more!) of the routes along the Great Washington State Birding Trail!